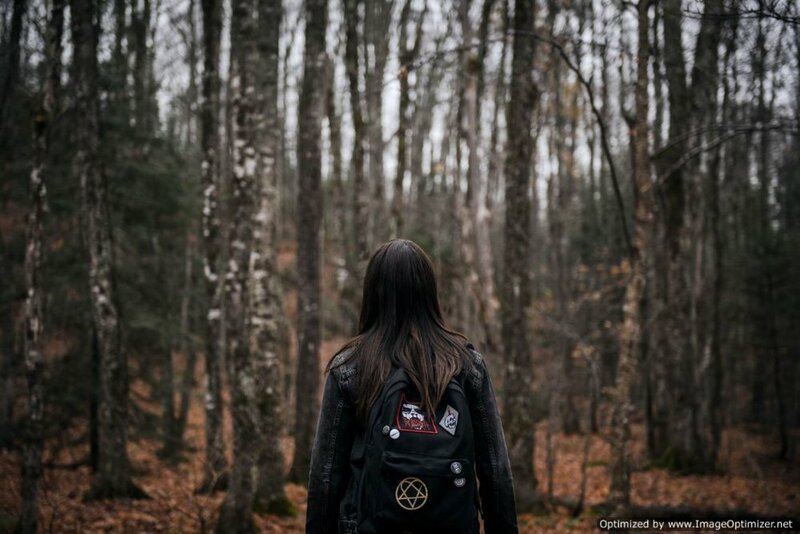 Pyewacket comes riding a heap of praise from various film festival audiences and for a teen-themed horror, its certainly a cut above the rest, providing plenty of atmosphere, unsettling moments and thought-provoking themes. Director Adam Macdonald uses a shooting style which immerses the viewer into the midst of the story without having to resort to POV/found footage. The camera acts as an unseen peer, tagging along silently with Leah. The editing style backs this up, so that some scenes play out with Leah's back to the camera. As a result, we don't necessarily pick up the cues to be scared from Leah's expressions - they come directly from our own feelings. The film uses its soundtrack to great effect too. When, for example, Leah completes the ritual in the forest, the background music stops completely, and we cut to a long shot of Leah in the distance, as if we (or someone) are suddenly observing her from afar. (Also, see if you can spot something in the background as Leah makes to leave!). Even though there are one or two nods to Paranormal Activity and Blair Witch (although much more competent than that film) Pyewacket isn't a film which deals in jump-scares. It's more about unsettling things being discovered and playing on your mind. For example, the morning after performing the ritual, Leah comes downstairs to find the front door open, and a mess of leaves and soiled scuff marks on the kitchen floor. Is it the result of a freak occurrence (maybe someone forgot to lock the door and the wind caught it during the night) or something more sinister and supernatural? While there are none of the usual jump-scares in this film, there is a classic fake-out, and the film-makers could have honestly played it either way - as a fake-out or genuine horror moment - and that's when Leah's friend Janice comes and stays the night, and Leah takes her out to the site of her ritual. The limited lighting in the forest really makes the scene work, allowing Janice to completely vanish. However this turns out to be just a setup for an even better, even more unsettling aftermath scene the next morning. The cast are great. Its good to see Laurie Holden on screen again after her run on The Walking Dead, and she's ably matched here by Nicole Munoz. The pair are dealing with grief in very different ways. Leah has become obsessed with the Occult, trying to make sense of death and whether there is anything on the other side of death. In her mind the proof of ghosts and demons would point to there being something beyond the scope of human comprehension. Her mother, on the other hand, doesn't share her daughter's thoughts. Her way of dealing with the loss is to Move On with her life and make a Fresh Start, and is angry and frustrated that her daughter doesn't share the same opinion. What's more, her grief is making her bi-polar, making her lash out at Leah one minute and be all sweet and understanding the next. Special mention needs to be made for Chloe Rose, who plays Leah's best friend Janice. The way she suddenly acts in the forest and the morning after are....unsettling to say the least! ... are the things that are happening just the imaginings of Leah's guilt-ridden occult obsessed mind, or is there an actual demonic presence stalking the house?The only real issue I have is that the film overplays its hand in a couple of scenes, leaving you more convinced of what is really going on. However the enigmatic ending does leave you pondering how much Pyewacket, if it exists, is responsible. Pyewacket is a lot different in style to most horror films coming out of the US. There's an Indie feel to the production and there are some scenes which look like they were filmed on the fly. There's no Ouija board to be found here, the black magic on show is borne of the earth and blood. There are a number of different ways you can interpret Pyewacket, but at the end of the day its a story borne of grief, and how two people cope - or don't cope, or refuse to even look coping in the eye - with that grief and loss that acts as the catalyst. The actions taken in the film try to leave it open to your imagination as to whether the ritual succeeded or not, however I think it eventually pushes you into one horrific conclusion.